A combination of missed chances and defensive mistakes contributed to a disappointing defeat by Guisborough Town on a damp afternoon at Hillheads. Guisborough started well and inside the first minute Steven Roberts tried his luck with a shot that flew wide of the target. Whitley’s first chance came nine minutes later when Luke Salmon had a shot blocked by keeper Jordan Nixon. The ball was then quickly played downfield and a misjudged tackle allowed a cross to come in from the right and Danny Earl slotted home from close range to give the visitors a 10th minute lead. Whitley should have equalised four minutes later when Salmon played an excellent cross deep towards the back post where Olly Martin raced in but with the goal at his mercy, got his foot under the ball and scooped it over the bar. The action was coming thick and fast as both sides showed attacking intent and in the 16th minute, the Priorymen capitalised on an error in midfield as Mason McNeill doubled their lead. Whitley got back in the game in the 36th minute when Brannen cut through the Guisborough defence with a precision pass to Salmon, who took the ball past Nixon before slotting it home from a narrow angle. Three minutes before the interval Whitley nearly equalised in spectacular style. Salmon played a neat ball down the left touch line for Jon-Jon Wright who attempted an audacious shot from well outside the box but unfortunately for the striker who was making his full debut, the ball landed on the roof of the net. The game became more of a midfield battle after the break with the visitors looking the stronger, and Bythway headed home a third goal for the North Yorkshiremen. With less than half an hour remaining, Whitley needed a rapid response if they were to have any hope of rescuing the game and that is exactly what happened when debutant Wright found space on the left edge of the box and fired home a fine shot that left Nixon well beaten. 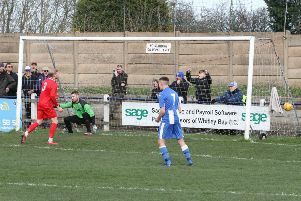 Briefly Whitley looked as if they might find an equaliser but their hopes were dashed with 12 minutes remaining when they failed to deal with a ball that was allowed to bounce in the box and Luke Nixon seized his chance to bundle the ball home.